I moved to the States in hope that I’ll get better access to technology and Windows Phone 7 was on top of my list. I tried to get a review unit but was turned down. But I played with the device enough to buy it when it came out. With some help from a friend and a helpful AT&T rep, I was able to get the Samsung Focus on the 9th, a day after launch. I finally got to use it as my primary phone and found some amazing features at the same time quite a few short comings which I’d attribute the OS to being v1. According to a friend in Microsoft, the core of the OS is stable and reliable to build upon which once you use the phone you realize that it is indeed snappy. It is as good if not better than the iPhone if that’s your benchmark. The AMOLED in Focus covers up for the Retina in iPhone 4. Setting up an Exchange email account (Outlook) and Gmail is extremely simple. Doing this in Windows Live Mail is comparatively way complicated. Subtle animations in Mail and moving between menus. Being able to turn off Facebook contact sync for those not in your Windows Live contact list. Picture Hub downloading albums from Facebook and SkyDrive when connected to the Internet. The auto background changing in the Pictures Hub is pretty neat too. Calendar sync with color codes for Outlook, Windows Live and Google (there’s a drawback related to this too). Xbox LIVE and Zune – Zune Marketplace is awesome, the Zune Tile changes to the recently played artist’s image. No screenshot support – to be honest, as I tweeted, I can live without copy/paste but I need to be able to take screenshots. I’ve imported several calendars into Windows Live such as the Facebook Events, these aren’t synced. Neither are shared (by others) Google calendars. Unlike in iTunes where you buy an app you can see the download progress in the download tab, you can’t in Zune so you don’t know where the app is, confused me initially since even though the phone was connected I did not know whether the app was being downloaded, synced or what. I installed the demo of NFS Undercover and then purchased it, I had to uninstall the demo and reinstall it again to get the full version, same was with Flight Control. The light after some time of inactivity turns dim or comes back on touch, this effect would look so much better if it faded in or out. The camera has quite a few settings customization but if you were to make them and exit the app, all those settings are lost. By default videos are shot in VGA res, no way to set 720p as default, refer to point above. When you turn the volume up or down using the physical buttons you get the option to set the ringer to vibrate, this does not turn all the functions to silent. Media isn’t and neither is the camera. In fact there is no way to turn the camera to silent. While I’m no creep there are times where you need to take images of your friends without them knowing, like today when a guy in the library had a trolley with ~11 really fat books and he was scanning sections from each book. One by one. Now that’d make for a nice pic, but I did not since he was twice my size. Besides, it was a library the shutter sound would’ve seemed out of place. 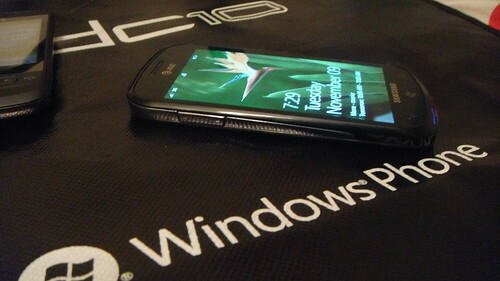 A major pain, there is no easy way to sync contacts from Microsoft MyPhone to Windows Phone 7. Multitasking is something I’ve missed in two use cases, playing Last.Fm in the background while doing something else and switching to IE to check something before tweeting through the twitter client. Other than that, I can wait. Setting a call to go to loud speaker involves more steps than it should. OneNote sync won’t work on my phone and the error I receive isn’t in the Support team’s database. Funny? Not so much. They want me to reset the phone. Update: This isn’t a WP error nor a SkyDrive error, probably Office Mobile. You can only mail a document from the Office Hub. You cannot write up an email and then select attach, you can only attach photos in this manner. I would’ve sent these as feedback to Microsoft had I gotten my hands on a review unit. Having listed these, someone asked me on twitter if I jumped too soon, I don’t believe so, I love the phone and WP7. Xbox LIVE, email and Zune amongst themselves make this a worthy buy.